A collection of math worksheets on finding factors, greatest common factors, and factor trees, as well as prime numbers & composite numbers. List all of the factors for the given numbers. 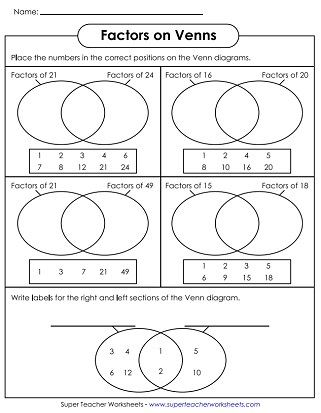 Sort factors of numbers on Venn diagrams. 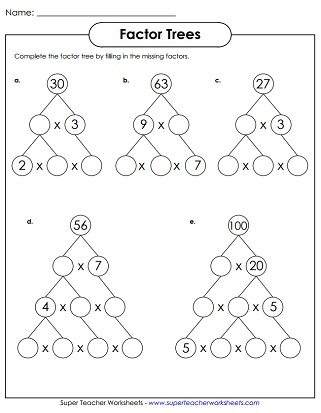 Complete these factor trees (different style) to reduce a number into its prime factors. More factor trees for prime factorization. Practice identifying prime and composite numbers. Complete the prime-composite number table. 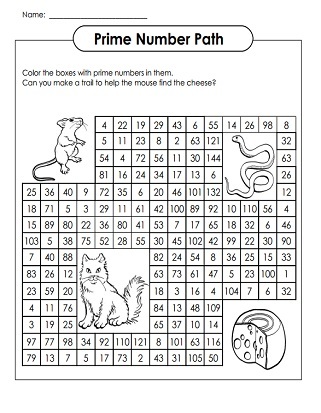 Color the prime numbers to help the mouse find the cheese. Color the prime numbers red and the composite numbers blue. Complete the page of short-answer questions about prime and composite numbers. Use the sieve of Eratosthenes to find prime numbers. The sieve is simply a hundreds chart. Students check off multiples of 2, 3, 5, and 7. Every number that is not checked off is a prime number. Find the GCF of each pair of numbers. List the proper factors of the given numbers. Proper factors are factors of a number, excluding the number itself. Here you'll find resources to help students review multiples of given numbers. Simplifying fractions, equivalent fractions, operations with fractions. Also includes adding, subtracting, multiplying, and dividing fractions.